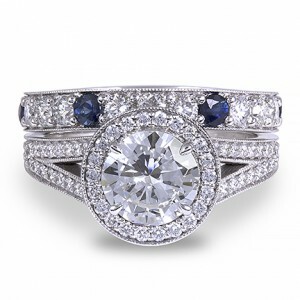 Over the past few years, we have turned more and more toward customizing the majority of the rings we create. At first our customers feel a little daunted by the task but when they learn about the process and start thinking about the benefits, they become eager and excited about the project. Most of the time we start with a nebulous concept, a quick sketch or a picture from a magazine. Using sample rings on our site and in our showroom we start talking about the different possibilities, proportions and options. We take copious notes and come up with an cost. After the initial meeting, we discuss our customer’s wishes with our design team and everything gets put into a CAD image. We review the initial CAD and make necessary adjustments until we are very close to what our customer envisioned. The wedding band, in its’ original incarnation had a huge swerve which made it impossible to wear on its’ own. In the design process, we softened that cure to the point that it is barely noticeable. We then present the CAD to our customer and upon approval move forward with the manufacturing process. In the case of the attached pictures, we used stones from our customer’s original wedding band along with sapphires from an heirloom ring. We were fortunate that they were nearly the same diameter. In the design process we were able to adjust the heights of both rings such that they would look good next to each other despite the difference in the size of the stones in the shanks. 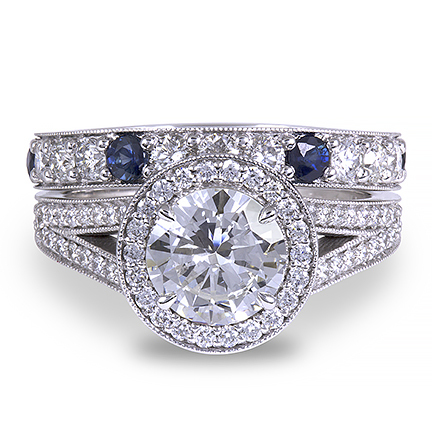 Once the design is approved, creating the ring takes about a week to 10 days. The end result is personal, unique and worthy of being yours.